The Insert Supply System represents a highly efficient bioreactor configuration suitable for small scale biomass or protein production as well as tissue cultivation like human artificial skin models. The heart of the bioreactor is flat membrane inserts that are placed in a Media Supply Plate. Its large media reservoir has the same footprint as a standard multiwell plate. The semipermeable flat membrane in each insert is made from different materials and properties depending on the application. 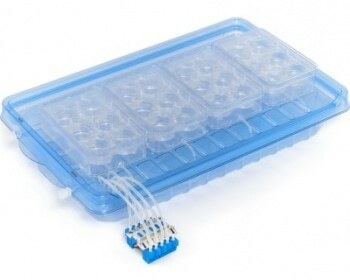 The membrane forms a two compartment system by separating cells from medium and allows high density cell culturing with improved culture quality. The Insert Supply System is available either as a manual set or fully integrated in a Cellab® Disposable Set operated by the Cellab® Docking Station.